Somewhere around 800 vehicles are expected to drive the 140-mile-long stretch between Seligman, Arizona and Topock, Arizona for a sunny weekend of good food, entertainment, and an excellent collection of vintage vehicles - cars, trucks, motorcycles and any other type of vehicle that is road worthy. Registration is open to all street legal vehicles - from buses, bikes, cars, trucks and recreational vehicles to practically anything with round wheels that runs. This years 30th Annual Historic Route 66 Fun Run® is set for Friday through Sunday, May 5th-7th, 2017. Don't feel that you need to be a vintage vehicle collector - you don’t even need a driver’s license to join in the fun! The Annual Historic Route 66 Fun Run® is the annual Historic Route 66 Association of Arizona's only fundraising event at which they raise much needed funds to fulfill their mission to preserve, protect, and promote Arizona's stretch of Route 66. All the people who plan and work the event, including the judges, are volunteers giving their time to make the event and the Association successful - this and to ensure that all those who attend have a splendid time. 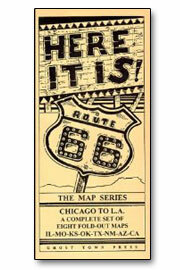 The National Historic Route 66 Federation has focused on making the historic highway a global phenomena by establishing a global Route 66 association and producing 3 and 4 day events in different locales along Route 66 that featured artists, musicians and collectors, and the John Steinbeck Awards evening which honors those working to restore the Route. It all started when a couple, David Knudson and his wife Mary Lou, wanted to experience the historic highway back in October of 1964 but could barely find it. There were no road signs and it wasn't shown on any maps. It had pretty much disappeared except for old relics of the highway sitting silently on the old highway bypassed by the interstate thoroughfares which had been built to replace the legendary highway. The iconic thoroughfare which had taken motorists from Chicago to the shores of the Pacific Ocean was still there, but had disappeared from the sight of contemporary travelers. Mr. and Mrs. Knudson wanted to enjoy the experience of not only traveling the historical highway, but eat at the ecclectic diners, sleep in the stylish motels and stop to buy souvenirs from old trading posts that had once lined old Route 66. So what were they to do...? Yep. They drove back to California, sold their business and started the daunting full-time task of bringing Route 66 back to life by creating The National Historic Route 66 Federation. Since those early days the National Historic Route 66 Federation has become a worldwide, nonprofit organization dedicated to bringing attention to the public of the importance of U. S. Highway Route 66 in America’s cultural heritage. The foundations efforts resulted in acquiring the federal, state and private support necessary to preserve the historic landmarks and revitalize the economies of communities along the entire 2,400-mile stretch of road. This is accomplished through public education, advocacy and membership activities. Their strategies include publication of the quarterly magazine Federation News, the Adopt-A-Hundred Preservation Program, a presence on the worldwide web, serving on the National Route 66 Corridor Preservation Program, publishing and marketing the Route 66 Dining and Lodging Guide and the EZ66 GUIDE For Travelers. They provide special events and assistance to the media, authors, learning institutions and production companies for highway Route 66 related projects. 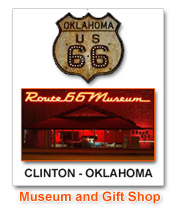 The National Route 66 Preservation Bill was passed by Congress and signed into law by President Clinton back in 1999. It provides $10 million in matching fund grants to individuals, corporations and communities for the purpose of preserving or restoring historic properties along the historic route. The Federation created the Adopt-A-Hundred Program which uses over 20 volunteer members who take responsibility for individual 100 mile stretches of Route 66. They drive their 100 mile stretches at least twice a year looking for and reporting possible preservation problems. Every other year they travel their 100 mile sections and review the dining and accommodation establishments. These detailed reports are then compiled for the latest edition of the Route 66 Dining and Lodging Guide. The main purpose of the guide is to encourage people to explore the historic highway and to help them find dining and accommodation that are unique and affordable. It emphasizes the vintage establishments so travelers can enjoy their historic roadway experience of bygone Americana. 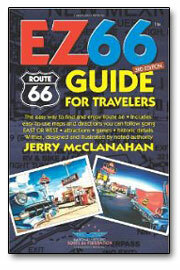 The EZ66 GUIDE For Travelers is a joint project between the National Historic Route 66 Federation and author/artist Jerry McClanahan. Its purpose is to make traveling the many unmarked/unsigned and often confusing segments of Route 66 as easy as possible to navigate. It shows that each of these historic segments offer their own unique view of the region in which they are situated. Film, radio and television production companies, as well as reporters and authors from around the world prepare material about Route 66 and seek out the National Historic Route 66 Federation for assistance every year. Obviously, the passion that the Knudson's had for this historic highway has resulted in huge benefits for travelers - whether they be Americans or foreign - individuals or professional groups. David Knudson and his wife, Mary Lou have been invaluable in preserving the historic highway for travelers wishing to experience this piece of history. Route 66 belongs to a more relaxed and playful era of American life when travel was slower and Americans were just beginning their relationship with the automobile. The architecture along the highway is often reminescent of the 1930's with art deco cafes and gas stations that catered to a new age of American travelers. The highway became representative of an era in America that started with the Great Depression, went through the war and in the end led America to the prosperity of the 1950's and early 1960's. This highway known as U.S. Route 66 was also referred to as Main Street of America, the Will Rogers Highway and the Mother Road was one of the original highways within the American highway system and was established on November 11th, 1926. But, the road signs for this interstate highway were not posted until the year after. Soon becoming one of the most famous roads in America as well as being a prime destination for visitors from abroad, the highway originally went from Chicago, Illinois, through Missouri, Kansas, Oklahoma, Texas, New Mexico, and Arizona before finding its final destination at the Santa Monica Pier near Los Angeles, California. The highway transversed a total of 2,448 miles or 3,940 kilometers from start to finish. The popularity of this highway was recognized by a rock-and-roll song as well as the successful Route 66 television show that ran for 4 seasons from 1960 to 1964. Route 66 served as a major roadway for people migrating westward during the Dust Bowl that occurred in the midwest during the Great Depression of the 1930s. Route 66 greatly enhanced the economies of the communities through which it passed. Businesses on the highway prospered because of the growing popularity of the highway, and it was these same business owners that later fought to keep the highway alive when being bypassed by the new Interstate Highway System became evident. Unfortunately, the highway was officially removed from the United States Highway System on June 27th, 1985 after it had been replaced entirely by the Interstate Highway System. Later sections of the highway that passed through Illinois, Missouri, New Mexico, and Arizona were designated a National Scenic Byway and given the name Historic Route 66. Also, several states have adopted certain bypassed sections of the former Highway US 66 into their state road networks and gave them the name of State Route 66. Diamond Creek is a rather dodgy stream that flows through the Hualapai Indian Reservation from Peach Springs, Arizona to the Colorado River. Diamond Creek Road is graded in the river canyon adjacent to the stream and even within the streambed in some parts of Diamond Creek. This road provides the only access to the Colorado River between Lees Ferry and Pierce Ferry - a distance of approximately 270 miles along the river. Diamond Creek Road is a popular launch location for whitewater rafting trips through the Grand Canyon. Some also launch from the same location to float downriver to Lake Mead. The Hualapai Indian tribal council charges a fee for all vehicles and people that want to use the road. It started out as a nominal charge, but seems to go up every year with the latest fee said to be $26.50 per person. When travelling Diamond Creek Road also beware of flash flooding when there is heavy rains. These floods have been known to damage or destroy sections of the Diamond Creek Road forcing it to be closed and even once washed vehicles into the Colorado River. Diamond Creek Road is accessed from old Route 66 at Peach Springs, Arizona between Kingman and Williams in Arizona. All in all, it is a very spectacular way of seeing the bottom of the Grand Canyon even if the Hualapai are charging an arm and a leg. The new Route 66 Dining & Lodging 16th Edition Guide has been enlarged to 188 pages. Including over 300 photos of listed establishments, it is in a 5 1/2" x 8 1/2" format with a spiral binding. It lists over 500 dining and lodging establishments objectively reviewed by the National Route 66 Federation, which allows no advertising and concentrates on the vintage properties that made the Route famous. Price ranges, amenities, where credit cards accepted, must see's and must do's and other specialty features are included. The guide covers all 8 states and comprises several major alignments of the highway. The Route 66 Dining & Lodging 16th Edition Guide makes an excellent traveling companion to the EZ66 GUIDE For Travelers . The Oklahoma Route 66 Museum is a recently redesigned museum funded by the State of Oklahoma as well as the residents of Clinton, Oklahoma that celebrates the history and signifigance of the famous roadway that connected Chicago, Illinois with Malibu, California.